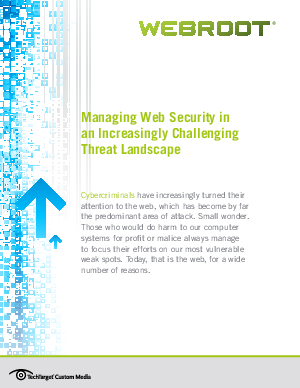 Managing web security in an increasingly challenging threat landscape. Cybercriminals have increasingly turned their attention to the web, which has become by farther predominant area of attack. Small wonder. Those who would do harm to our computer systems for profit or malice always manage to focus their efforts on our most vulnerable weak spots. Today, that is the web, for a wide number of reasons. Read this white paper to learn about managing web security in an increasingly challenging threat landscape.